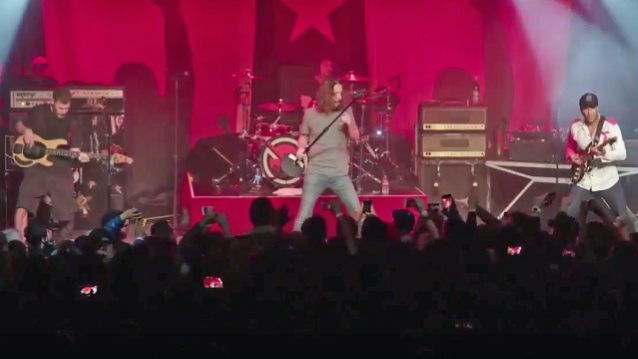 AUDIOSLAVE performed together for the first time in over a decade on January 20, reuniting at the Teragram Ballroom in Los Angeles as part of the Anti-Inaugural Ball, a star-studded concert protesting the swearing-in of Donald Trump as the nation's 45th president. The band played three of its best-known songs: "Cochise", "Like A Stone" and "Show Me How To Live". AUDIOSLAVE features SOUNDGARDEN singer Chris Cornell alongside RAGE AGAINST THE MACHINE guitarist Tom Morello, bassist Tim Commerford and drummer Brad Wilk. PROPHETS OF RAGE, which also features the three RAGE members plus PUBLIC ENEMY's Chuck D and CYPRESS HILL's B-Real, also performed at the concert, which was livestreamed across the Internet. Cornell told Music Radar that reuniting with his AUDIOSLAVE bandmates was "pretty fun. It was interesting because the dynamic for that band was really just there. I don't know how much those guys rehearsed the songs, but I had the same experience when I went on stage with Tom a couple of years back: where we walked into the room for a rehearsal, and we didn't even really need one. We just counted the songs in and they were totally where we left them ten years ago when we'd just got off the road." He continued: "Now, that's pretty crazy — all the energy and everyone remembering everything, and you're already playing the song with feeling, as opposed to trying to find it and remember where it is, so it was pretty great, and the energy was good. "And I think the event was great; it was bittersweet, because there's an awful lot of emotional fallout and anger from the most recent election, and I think that a lot of people don't really know what to do with that energy, and I think that's something positive to do with it. Everyone that was there seemed to feel like they were somewhere that was vital and somewhere with like-minded people doing something positive." Asked if fans can expect more performances from AUDIOSLAVE in the future, Cornell said: "It's always a possibility. I mean, we've been talking about it for at least three or four years now. We were talking about actually picking dates, and it just ended up not working out because everybody's so busy. "They have another band again, they all have separate bands that they do themselves, I have SOUNDGARDEN and a solo career that's taking up a lot of time, and I just did TEMPLE OF THE DOG. So, it's really honestly as simple as we end up having a window of time where it's comfortable for everybody and we want to do it, because I definitely feel like everybody's up for it." AUDIOSLAVE came together in 2001 following the then-dissolution of both SOUNDGARDEN and RAGE, releasing three studio albums and a historic concert set recorded in Cuba before Cornell exited in 2007, ending the band.